I live in Oakville, Ontario and was preparing the breakfast a couple of days ago and an animal like a rat was in my backyard. I seems to be a rat, but some people told me that this is a Possum. I do not know who to contact, a pest control or whom? It seems is living below the deck of my pool. If any of you have a hint, I'll appreciate the comment. I am attaching the picture. Hello Li, yes, what you have there is a Possum, officially known as the Virginia Opossum! They are pretty harmless and don't cause much trouble and when they feel threatened, will roll over and play "dead". Thank you for sending us your picture! 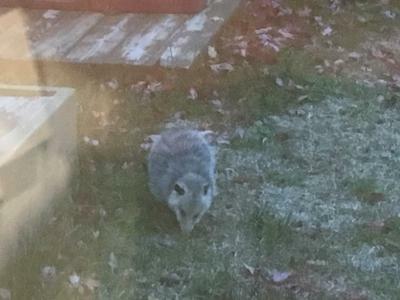 Comments for Is this a possum? We have an Opossum that lives in our backyard under the fence! We have named him Sheldon he's very slow and he means no harm. Once in a while he comes and checks out the bird feeder, eats some seeds and sometimes we give him apples. In the spring he'll be very happy to eat your grubs! When we come outside and he's in the backyard he actually just runs back underneath the fence. Even our cats find him very interesting and have no interest in harming him or him harming them. At least we think it's a boy. carries rabies as do Skunks and Raccoons.